Health-conscious consumers read nutritional labels, but it's nearly impossible to get the nutrients we need with diet alone. To get the USDA-recommended daily quota of vitamin D, for example, you need to eat 15 eggs or 26 sardines; of iron, 414 almonds or 15 cups of broccoli. So we rely on nutritional supplements-vitamins and minerals, probiotics and enzymes-but the variety of pills, products, and elixirs on the market today is overwhelming. And, as we have seen in recent news, some of these products are downright fakes. 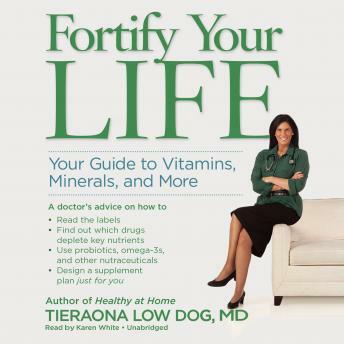 Trusted natural health physician and bestselling author Tieraona Low Dog, MD, provides a personalized approach to using nutritional supplements for your specific health needs, helping you navigate the complex and often confusing landscape of vitamins, minerals, and more. Dr. Low Dog explains the basics about every essential nutritional supplement and guides the listener in creating a personalized supplement plan, tailored to individual genetics, age, gender, and lifestyle. Low Dog evaluates current research, explains the relationship between food and supplements, describes how medications cause chemical imbalances in the body, and advises on how to judge brands and read labels. Low Dog engages and encourages listeners to take charge of their own health and provides guidance to finding the right combination of nutritional supplements to improve mood, strength, energy, and overall well-being.